Despite the problems that I encountered when making my flower scarf using Bernat Mosaic yarn, I wanted to use up the yarn that was leftover from this project; better to make something from it than have it sitting in a bin in the basement. 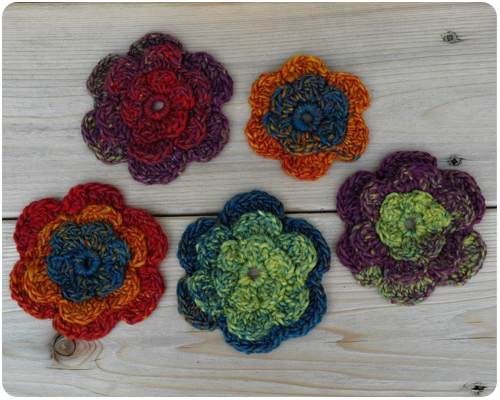 So I made as many flowers, like were on the ends of my flower scarf, as the leftover yarn would allow. And I am going to use these flowers as brooches to dress up an otherwise plain coat by simply pinning them to the front with a safety pin. 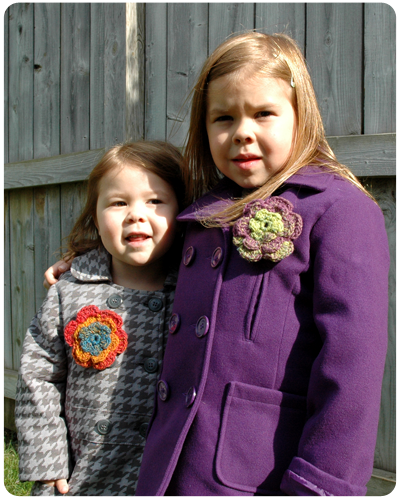 My girls thought this was a beautiful idea and were quite willing to model for me. Love it - a quirky and whimsical handmade touch.